The NUS Literary Society is collaborating with the South Asian Studies group to bring you a month of South Asian literature for three Thursdays this October. The theme is “Male, Female and In-between – Performing Gender in South Asia”, and there will be film screenings and short stories, followed by a discussion session. So if you are free from 6 to 9pm on Thursdays, come on down to AS5-0309 and join us as we explore this interesting genre. For more details, please refer to the poster below or visit our facebook event page. 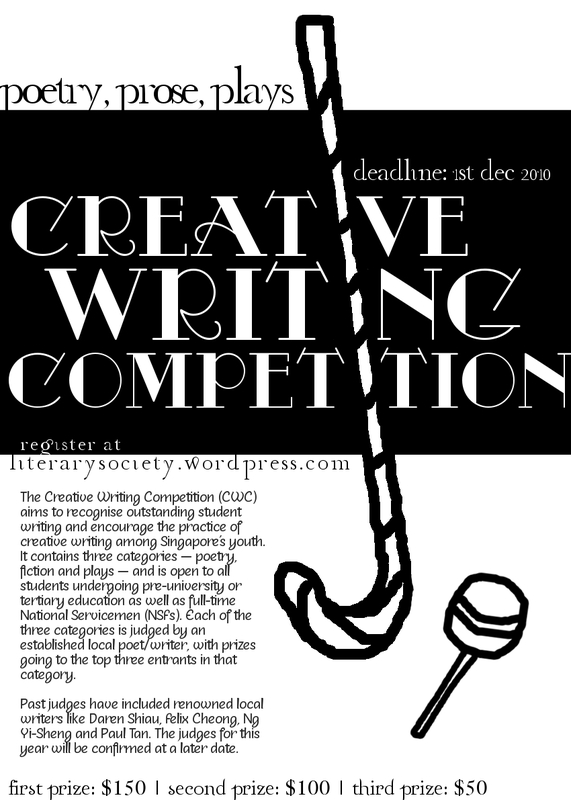 The Creative Writing Competition 2010 is now open, and the deadline for submission is 1 Dec 2010. The judge for poetry is Alvin Pang, while Ovidia Yu will be judging prose and poetry. The entrance fee is waived this year, so do download the entry form here and unleash your quill. For more details, please visit our Creative Writing Competition 2010 page.